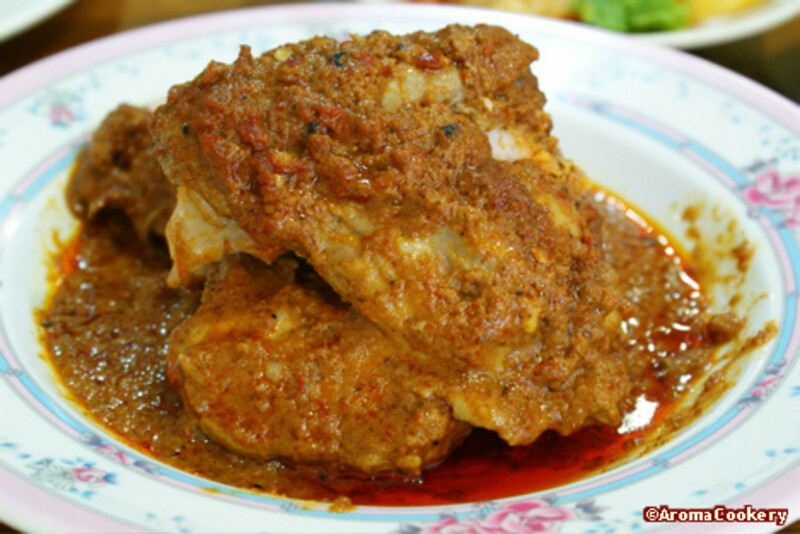 Rendang, a spicy beef or chicken concoction: My Grandmother’s all time favorite recipe! Chicken Rendang if you prefer! I have decided that it is time to do my grandmother a little honor - and what better way to give her an accolade than one to do with cooking! I come from a family of Peranakans, Chinese born in the Straits of Malacca and Singapore. The women folk of these families have a tall order to fulfill. Matriarchs who hold the family rein, they are expected to be the best of cooks. 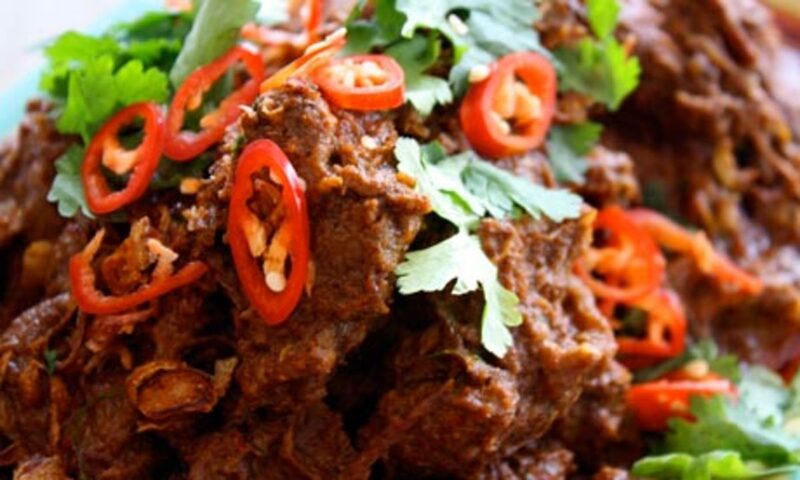 My grandmother is no different, and her recipe for Beef Rendang has been popular for decades. In her sprightly eighties, she still prepares the dish for family and friends to savor. 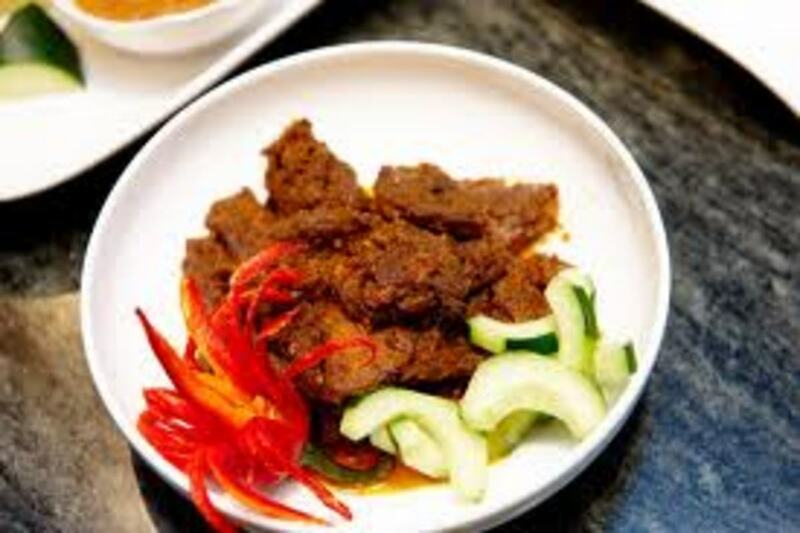 Beef Rendang is a spicy ethnic dish, prepared mainly by Malay, Indonesian Peranakan families, that originated from thes Minangkabau region of Indonesia. It made its appearance as a ceremonial food to honor guests. 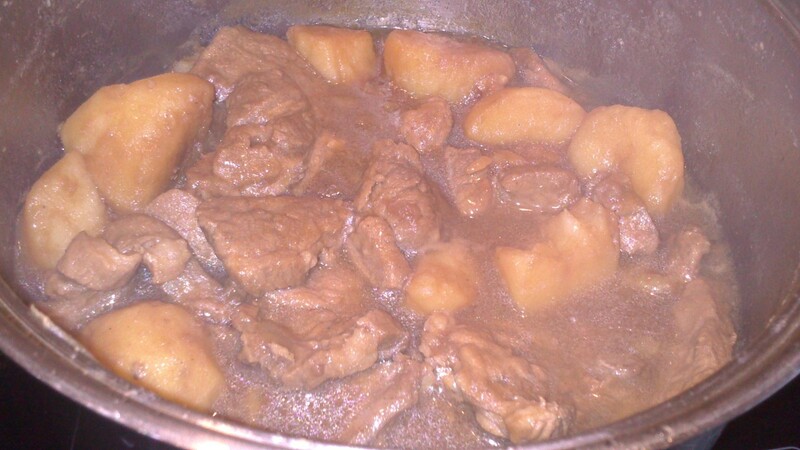 Foodies sometimes describe the dish as caramelized beef curry, for indeed after preparation and with the correct consistency, it is indeed what it looks like. 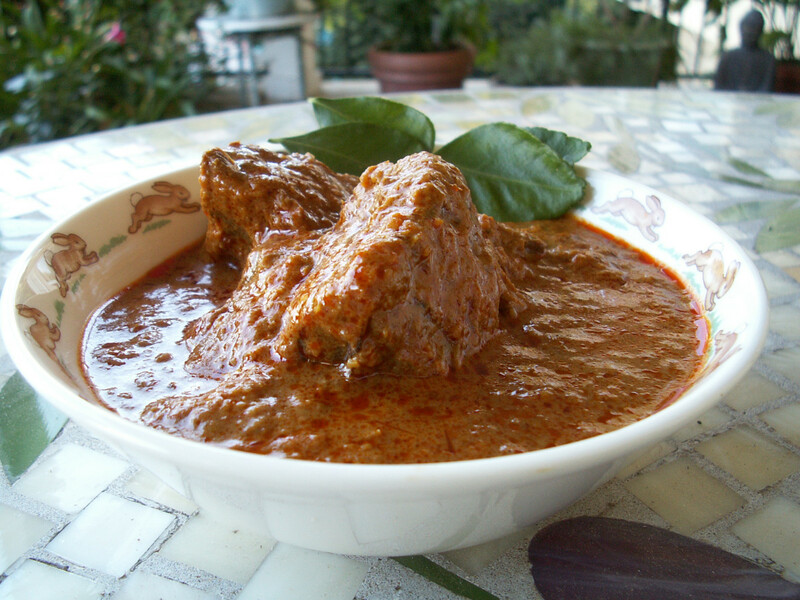 Authentic rendang, though, is nothing like curry, for its gravy is not diluted but dry and thick. Too watery, and it means that the correct consistency has not been achieved. My grandmother used to, and still prepares Rendang for the family when they request to have their cravings for it fulfilled. I, the culinary stalker, would watch closely as she seamlessly prepared the ingredients for the dish and combined them into what would be a scrumptious delight. The dish was always a hit with my grand aunts and uncles, who would arrive in cars practically screeching to a halt to sample her efforts. It was a time to relish in family warmth, jokes and with our Chinese heritage, we would play a game of “mahjong”. Mahjong is a game, similar to rummy, involving 136 tiles based on Chinese characters and symbols. It involves a marked degree of calculation, skill, and like rummy, chance as well. I would watch in fascination as my folks would eat the rendang, build the tiles and score points over one another. This recipe feeds a family of four, and adjustments to the quantity of ingredients can be made according to how much the cook desires to prepare. The dish, being a popular catered choice at parties, can serve as many as desired. It is good to use shin beef rather than topside beef for this recipe as the cuts tend to be more tender, though this is a matter of preference. The amount of spice in the dish can be adjusted, as with the levels of salt and sugar, to one’s personal taste. The original recipe calls for candlenuts.My grandmother usually prepares the paste by grinding the spices and combining them herself. 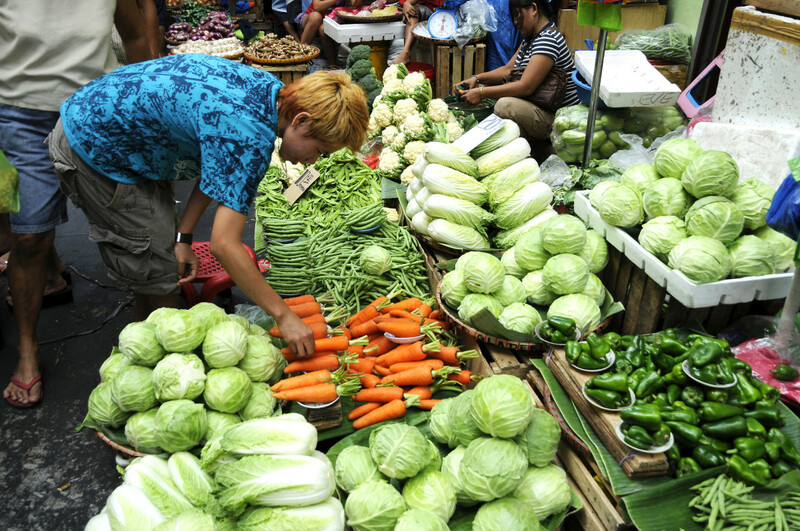 However, with rendang packets available at most supermarkets and Asian stores, there is no need for candlenuts as they have already been combined in the preparation of the paste. However, do make sure that all the other spices have been readied. 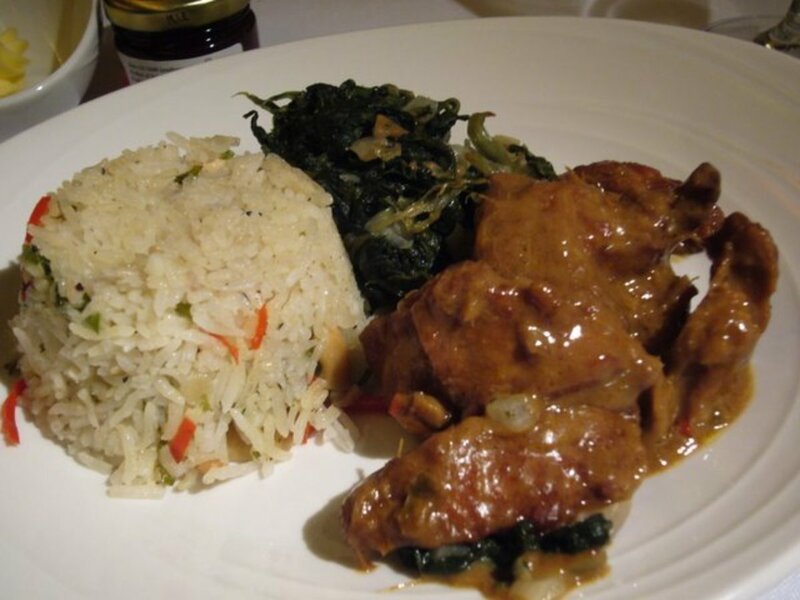 For those who prefer not to use beef, chicken is a good meat substitute in this dish. It involves no change in the method of preparing this dish or in the ingredients used. The dish is flexible and can be eaten with sides of rice, bread or even pasta if you so prefer! 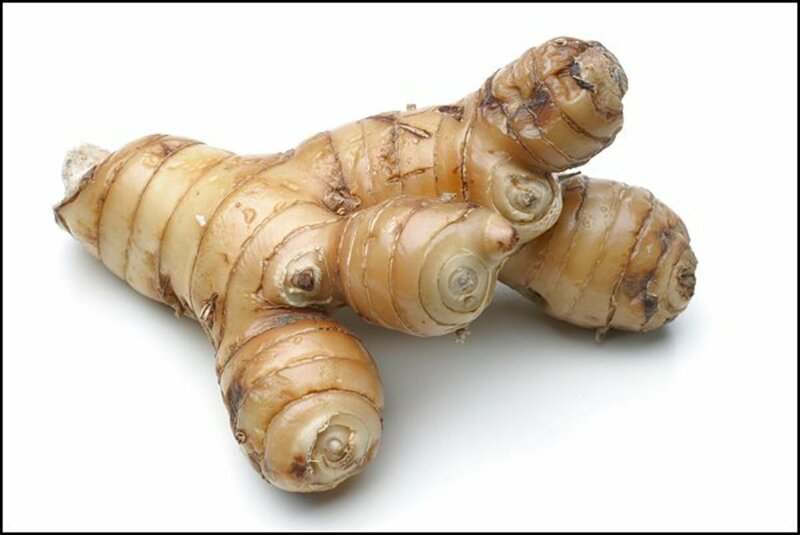 What is Galangal or blue ginger? 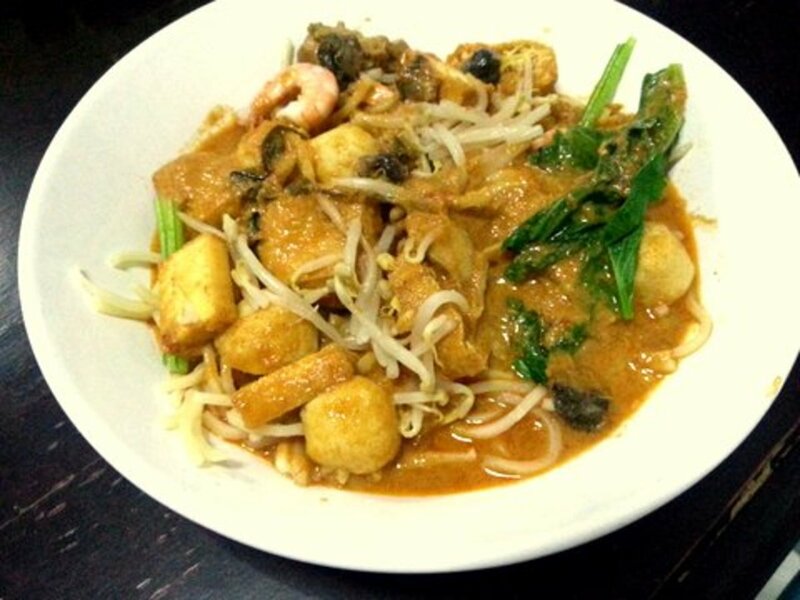 Most spicy Asian Fare require the use of Galangal, or Blue Ginger, as it is more widely known. The other name for Blue Ginger is Galangal, a rhizome of the ginger family that is often used in spicy Asian cuisine, Thai, Malay fare. It is different from ordinary ginger because it has a more distinct, stronger taste, but no, it is not actually colored blue! 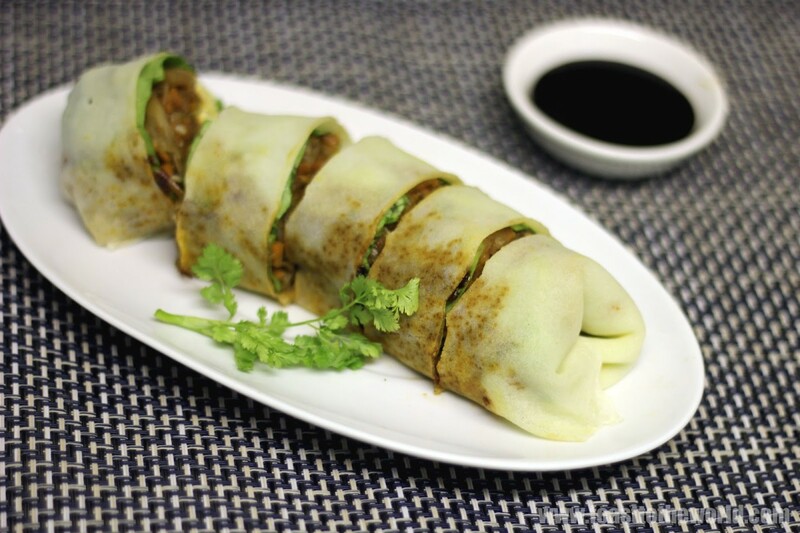 It complements Asian cuisine because of its strong flavor, and certainly goes well with Rendang! Rendang Paste-this brand of paste is very good! Fry shallots until they are golden brown and leave them aside. 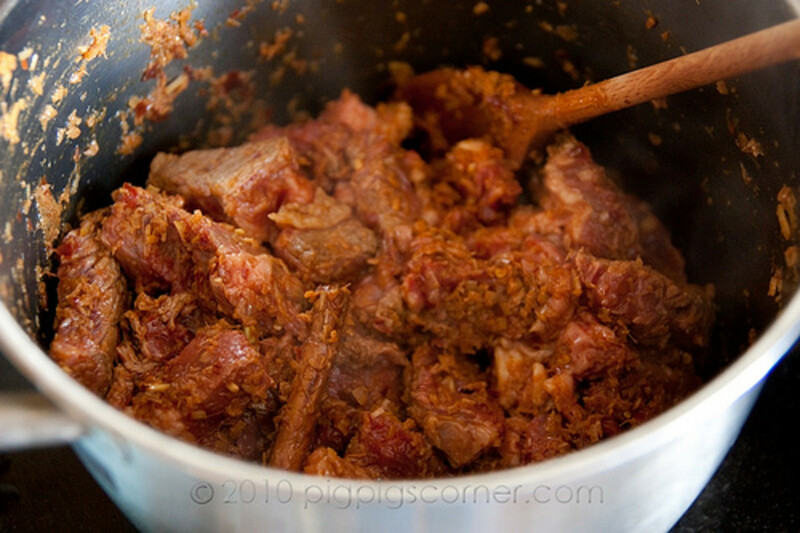 Add in the rendang paste and fry for a few minutes, until a lovely fragrance is emitted. Add the blue ginger, lemon grass, cloves, cinnamon stick and lime leaves. Add the meat and fry for about ten minutes. Add two rice bowls of water. Mix until the paste is consistent. Add the packet of coconut milk and stir. Add the teaspoon of salt and sugar. Taste for preference and adjustment. Add the fried onions, some lime leaves and a stalk of lemon grass as a garnish. Recipes Using Cream of Mushroom Soup: Versatility in a Can! Hi Julie! Hope you enjoy the Rendang, do let me know how it goes! Hi Jools, tell me how it goes!! Feel free to ask. Hi Elena! Thanks for coming by, and yes, it will definitely make a change from all that turkey! Thanks for sharing! Awesome Recipe's and I like the presentation. My favourite will be the Beef Rendang with fried rice. I would like to experiment with that over the Christmas holidays - a nice change after all the Turkey. Thanks, Tealparadise. Since you're in Asia, you should be able to get the ingredients! You sound like you love trying new things...so I'm so happy to connect and share too! Wow! Looks amazing. Pinned & followed. Thanks for the description of the difference between ginger and galanga...glana... you know. I just moved to Asia so hopefully I can access all these ingredients easily! Happy to have another good looking recipe that I can make without resorting to imported ingredients. Can completely understand, Mike. Cooking indeed takes a lot of time, of which we sadly seldom have these days. When you do get a chance to try it, let me know! Thanks for coming by! This looks seriously delicious and I'd love to make it but unfortunately I don't have the time to cook .. especially trying foreign to me recipes (even if I love it). Maybe I'll try it though and let you know the results. . Thanks, Linda! Hope that it tastes good! You certainly did your grandmother proud with this tribute to her cooking! Up! Awesome! Yummilicious! Great question, Peggy! The other name for Blue Ginger is Galangal, a rhizome of the ginger family that is often used in spicy Asian cuisine, Thai, Malay fare. It is different from ordinary ginger because it has a more distinct, stronger taste, but no, not colored blue, actually, just a term of reference! I hope you like this...do let me know if you've any problems when you make it! Appreciate the share!! Really enjoyed hearing about your family traditions. 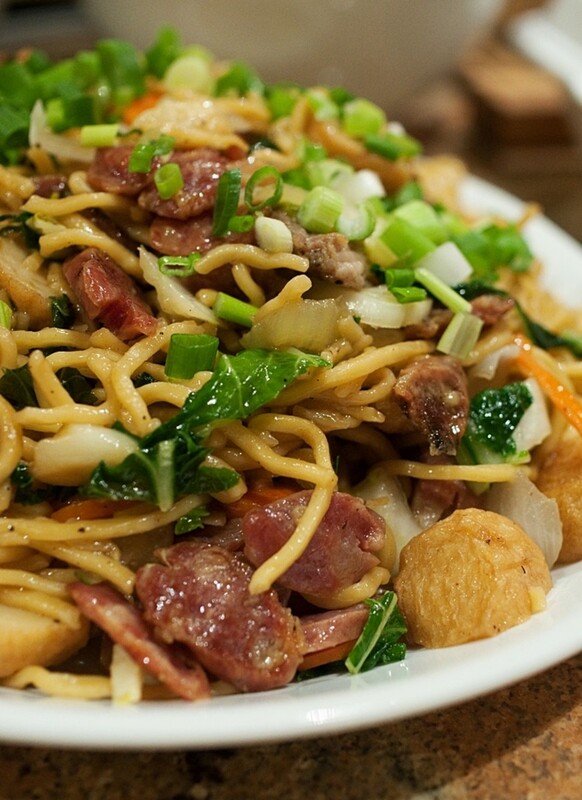 You are very lucky to still have your grandmother cooking for you! Thanks for giving us this good sounding recipe. I have fresh ginger in the house but never heard of blue ginger. Is the taste that much different and is it actually colored blue? I like curried flavors so know that this would be good. Up votes and sharing. Thanks for giving this a try, Cogerson...if you encounter any problems, let me know! Hope your family likes it! Sounds like a very promising meal to serve my very picky eaters....we are always looking for new things to try in the hopes of finding something we all like.....so we will give this one a spin and let you know....very cool that you are passing down your grandmother's favorite recipe...voted up and useful. Thanks Debbie...sorry to reply so late!! Grandma says hi and that she's glad you like her recipe too. If you need the paste, do get the one in the link....one of the better brands I'd recommend. Thanks for sharing!!! delicious recipe. looks very special, Michelle. Hi Tess! Thanks for bookmarking this, and I'll be sharing more of her recipes in future hubs! I hope you like it....thanks for coming by!! Thanks Ish, I hope you enjoy this recipe!! 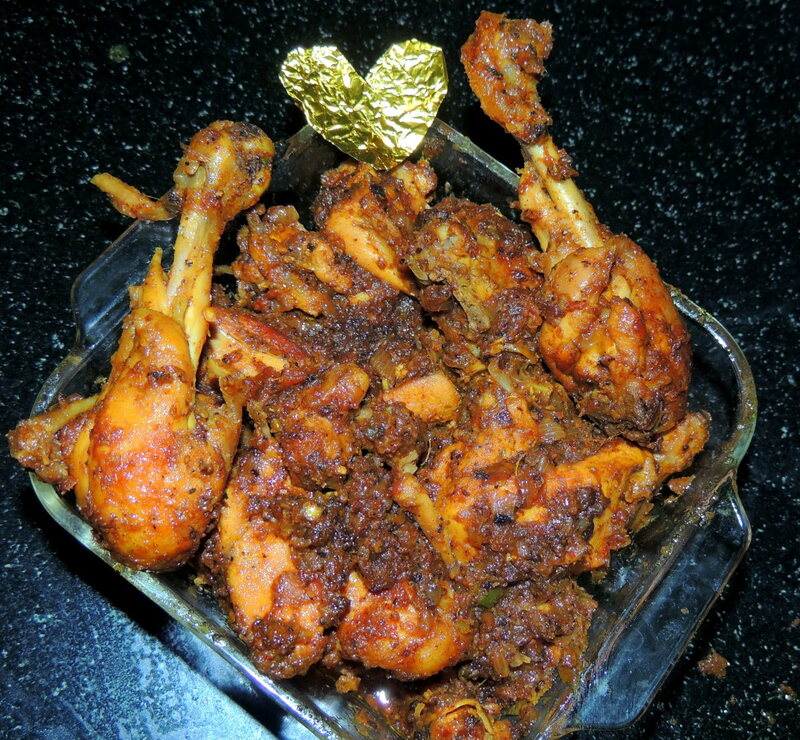 I love anything spicy... so I hope to reach out to spice lovers!! Thanks for the help, my dear, really appreciate it! A yummy dish, especially with chicken! A nice tribute to your dear grandmother and sharing your family moments added a nice personal touch to this engaging hub of yours! Your instructions are clearly explained! I like to try various exotic dishes such as this one! Well-done! Thanks Kim! This is a lovely dish that I'd thought I'd just share on behalf of my grandma. Thanks for the pin, my dear! Cool, Hatter! Thanks for coming by! If you can't find the paste, just order from the link up there. Hope your family has a feast! Thank you for this treasure. I'll have my daughter whip up. I'm sure it will taste good. Thanks, Yes, for coming by and saying yes! Thanks Ruth! Glad you like this and thanks for coming by! I voted up for sure. Hi Mary, thanks for coming by. Just edited a little about when to add in the meat...it's after you started flying all the other spices!! Do try this and the paste is available on the link!! Hope you enjoy it! I am so glad you are a culinary stalker! This sounds great and looks delicious. Can't wait to try it. I have one question, do you brown the meat with the shallots or cook the meat after the shallots are browned? Can't wait to try this. Mary, thanks for coming by! Shin beef is beef from the cow's shin area....if you can't get it, ask the butcher for the tenderest cut he has. :-) Just buy the paste from the link I've posted on the hub! Prima's a great brand, but it might take a bit of time to ship over. Thanks again! I learn something new every day here on HP, and today I learned about Rendang. I would love to try this if I can get the ingredients. I'm not sure what beef shin is. We don't have an Asian market here where I live, but I guess I could order the Paste. I voted this UP, etc. Oh! You've reminded me. I'll post a link on the hub, Jools! For Prima Taste Rendang Paste, from Amazon. It's a great brand! Thanks for coming by, and I hope you enjoy it! Michelle, I am a curry-a-holic and this Rendang looks delicious. 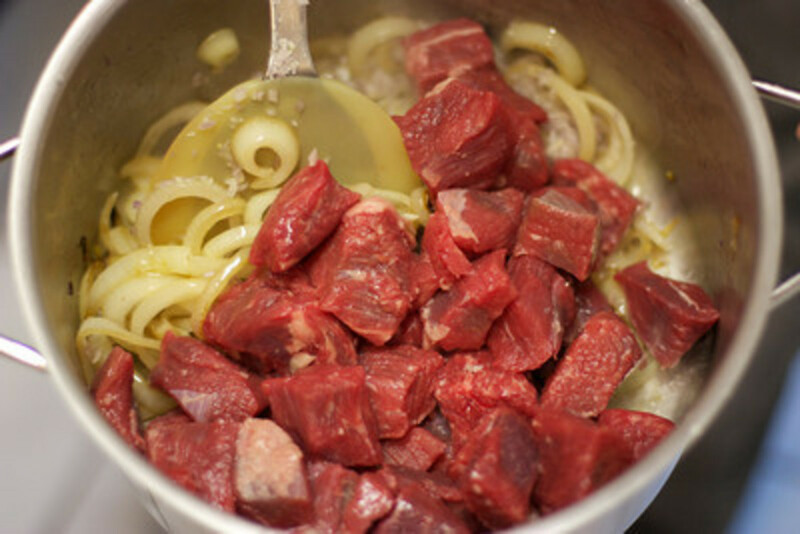 I love using shin beef as well, one of the most flavourful cuts of beef, takes yonls to cook though. I will bookmark this for later and will need to look out for the Rendang Paste online. Voted up and shared. Tobusiness, it sounds like a glitchy network problem! Not new knowing what has been happening here these few days.Thanks for posting again and for the support...sorry that the earlier comment seems to have disappeared! Hope you'll enjoy this if you've the time to make it! I though I'd posted a message from my ipad, on my way from work but it seem to have disappeared into space. Anyway, I just wanted to say great hub, looks delicious and you've done you grandmother proud. Thanks Janine. This is easy to do nowadays, my gran used to pound and grind her own paste. These days, it's all pre-prepared! Thanks for coming by, my friend.